It just can't happen. You just can't allow what happened yesterday afternoon to be swept under the rug as part of some learning process. Nor can you fully lay the blame at the talent-level of this team. Being outclassed by a fast Dallas Stars team is one thing, letting the game fall apart after working hard to cut a three-goal lead is yet another. But, like someone said on twitter, perhaps it wasn't the greatest of ideas yesterday putting out the fourth line after a powerplay goal cut the Stars lead to 3-1.That fourth line featuring Johan Larsson, Scott Wilson, Jordan Nolan along with a suspect d-pairing of Jake McCabe and Justin Falk just might be the slowest five-man unit in the entire NHL yet there they were, deployed against the Stars' top line and top defensive pairing. 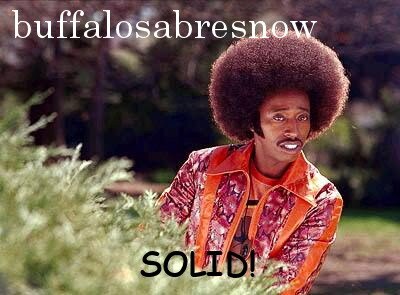 What transpired was a comedy that wasn't too funny for any of the Buffalo players involved or, for that matter, those in Sabreland watching. It just wasn't fair as it took Dallas all of 38 seconds to restore their three-goal lead and leave Buffalo's players on the ice looking like Keystone Cops. After that goal to make it 4-1, the Sabres as a team checked out while the sound of many a TV were heard clicking off in Western New York. They didn't miss much. Final score: Dallas-7 Buffalo-1. AS for the players, we can debate whether or not highly paid professionals should just give up on any occasion, and I'm of the opinion that you play hard until the end, but they're humans just like you and I. An 11-25-9 team in yet another three-goal hole against a faster, more talented team with a coach in Ken Hitchcock that has over 800 NHL wins and a Stanley Cup to his name had the odds stacked against them to begin with. After the Stars scored their fourth goal with just over half the game remaining, the Sabres looks as if they were already on a plane to Western Canada where they'll kick off a three-game road trip in Calgary on Monday. This is the seventh time in 46 games this team has gotten steamrolled. The first two times it happened in Games 2 and 3 of a young season as the NY Islanders (6-3) and New Jersey Devils (6-2) buried the Sabres. The latter loss came in a matinee on the first "Kids Day" of the season at KeyBank Center. Yesterday's 7-1 debacle was also on "Kids Day" and any kids attending either of those games might be scarred for life. 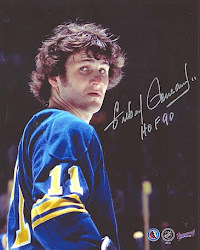 The Sabres also got shellacked against the Pittsburgh Penguins in a home-and-home to open December. In both of those games, it wasn't as close as the 9-1 combined score would indicate. And after seemingly righting the ship for the rest of December and into the Winter Classic on New Year's Day, Buffalo went on to lay eggs on the road against the Minnesota Wild (6-2 loss) and five days later at home against the Winnipeg Jets in a game that was 6-2 Winnipeg with just under 13 minutes left in the third period. This is not good for the organization or their fans. Although the local media might not be ready to say it and even though indications are that Housley will get a mulligan this season, there has got to be plenty of second-guessing when it comes to his hire to the point where they could, and maybe should, be ready to move on from him. Nothing personal, but whatever he's been doing hasn't been working and there's no indication right now that it would work even if they landed prized 2018 draft pick, defenseman Rasmus Dahlin. Housley was hired as an up and coming coach who worked wonders with the Nashville Predators defense. Last season they were the most feared d-corps in the league and they lead the Preds to the Stanley Cup Finals. When Housley came in he was expected to help turn around one of the worst defenses in the league that was mildly re-tooled with puck-movers to his and GM Jason Botterill's liking. Although some dead weight remained from the previous regime, the transition left the team with some new faces yet they've still been unable to play competent defense with any consistency. Perhaps that lack of defensive awareness can be attributed to players (including forwards) cheating up-ice in order to run in Housley's aggressive system. Perhaps it could be a rookie coach hiring a rookie assistant to handle the defense. Or perhaps it was Housley's failure, as a rookie coach, to recognize after the Islanders and Devils debacles that what he wanted to do won't work with this personnel package and that in order to win and/or stay in games, he'd need to think more defensively. Or as a colleague of mine texted me in disgust, "Slowest team in the league, still haven't figured out they should be trapping." Then again, one could place a good chunk of the blame on the players as well. This Sabres team notorious for coming out of the gate slow and having to play catchup. When you're in a hole versus fast, talented and well-coached teams like the Devils, Penguins and Stars, that hole can get mighty deep incredibly fast. Why is this team coming out of the gate slow? Some of it might attributed to a perceived "country-club attitude" on the part of the players. Fans would like to lay the blame squarely at the feet of the players saying that they should be motivated by playing a game and making a good living doing so and there's a lot of credence to that. But coaching styles do affect the players. Although the days of the "Iron" Mike Keenan bag-skate are long gone, getting players to practice with intensity and holding them accountable at all times is a necessity. That won't happen if there's no respect for the coach and we end up hearing the phrase, "losing the room." It's been said that Housley has been calling for more intensity during practice for a while but, based upon his recent won/loss record, his message doesn't seem to be getting through. And if Housley's message isn't getting through, he's either lost the room, or is in the process of losing it. No one will ever be able to convince me coaches don't make a difference. The coach of that 2014-15 team was Ted Nolan, an old-school coach who lacked chalkboard savvy, but made up for it by somehow motivating his players to run through brick walls for him. With the Sabres intent upon finishing last that season, it got to the point where then GM Tim Murray had to move every ounce of borderline NHL talent from that team in order for them to finish last and thereby be assured of either Connor McDavid or Jack Eichel in the draft. It's not hard to imagine that Nolan would have a better (maybe even much better) record with this team than Housley presently has. That's not to say that Nolan should be re-hired or that if he was that he would be able to take this team into the playoffs and beyond. Some coaches can take a destitute team and make them respectable, but not much more than that. Some coaches can take a below averaged team and get them into the playoffs, maybe win only a round or two. And some coaches might not be able to do any of that, but can take a playoff team that's on the brink of being a contender, all the way to the championship. One thing we do know, in sports, most rookie head coaches have a tough go of it their first year and have a tendency to underachieve, sometimes abhorrently. Some of those will last through their first season, some will last into the next season and some may even last the length of their contract and maybe in to another one. The Sabres need to figure out how Housley fits into that equation. Right now it looks as if he's in way over his head and it's hard to see him getting out of this one. Odds are that he'll make it through the season, but the cost will be high. Tank fans love this as they'll finish near the bottom and have the best shot at landing at the top of the draft. But if the player they drafted comes into a losing situation that's toxic, what good is that? What 18 yr. old can handle the weight of a franchise that, according to WGR550's Mike Schopp, hasn't gone into a game with a winning record since January, 2013, as span of over 450 games? The Housley honeymoon ended rather quickly as they dropped those two games to the Islanders and Devils early in the season. As the season went on injuries to his defense-corps and adjustments to his system kept the wolves at bay even though under Housley, the league's No. 1 powerplay unit last season dropped to 30th this year. After getting whopped by Pittsburgh in early December, the Sabres had a respectable month that carried into the new year with a hard fought, overtime loss to the NY Rangers. Since then it's fallen apart. Where this all leads this season remains up in the air, but the Sabres have to at least be thinking about doing the unthinkable between now and the 2018 NHL Draft--firing another coach. It might be unseemly, but from what we've seen, it's not unwarranted. It might set them back again, but finishing with a record even close to the tank years means they've already been set back a few years. What owners Terry and Kim Pegula, along with Team President Russ Brandon and Botterill come up with will be very interesting these next five months or so. The trade deadline means that in all likelihood the team's second-leading scorer will be on the move and it's a good possibility that their starting goalie will get traded as well. Other players on expiring contracts may also get moved so where does that leave this team? Not in a good spot. And in instances like that, the head coach is usually the one with his head on the chopping block.